Extensive damage to Audi Sedan, suspect wheeled away in stretcher. Classic Car Club Manhattan is positioned literally at the mouth of the Jersey-bound Holland Tunnel entrance. Broome street is used by the Port Authority cops to redirect tractor trailers (since they're not allowed in the tunnel) and delivery trucks that are too high. It's usually pretty quiet, but tonight, we heard 3 extremely loud knocks at our door. It was the Port Authority police. We had a vehicle on Broome street, which we sometimes do (after checking with the Port Authority police, of course) but it had to be moved NOW. I grabbed the keys, ran to the door, and once I was outside I noticed an Audi SLAMMED into one of the cop cars. It seems that the motorist was headed to the tunnel, hit something on the driver's side of the vehicle (no idea what), then quote "aimed" for the Port Authority police. The cops wrestled this guy out of his Audi, and swiftly put him in the rear of the police cruiser. He was repeatedly kicking the window while in the back of the car. This is all developing as I write this, by the way. 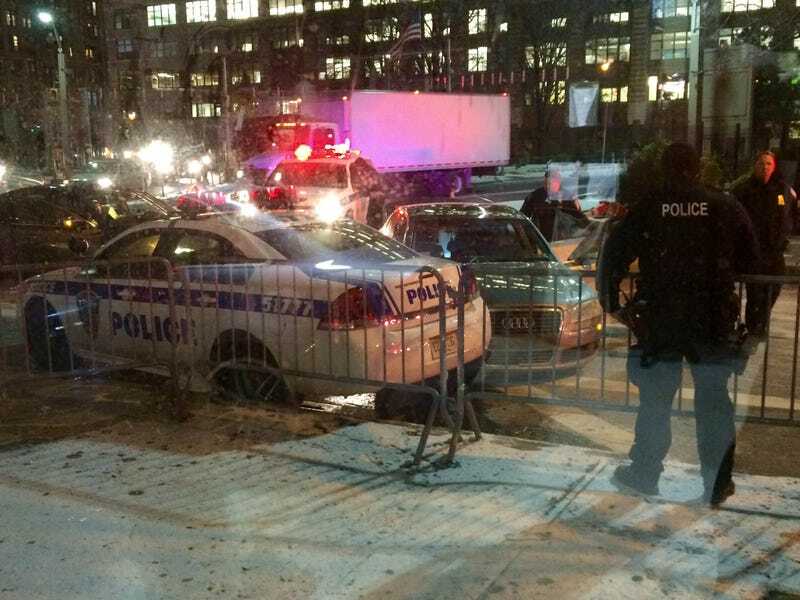 Update: Port Authority police said motorist "aimed" for two cops standing outside tunnel entrance, cops dove out of the way just in time, vehicle slammed into Port Authority cruiser positioned on Broome street facing the tunnel. Update #2: Just spoke to a reporter at the Washington post, driver was supposedly screaming he "wanted to kill cops". Motorist being wheeled away on stretcher. View facing southbound on Hudson Street. Update #3 (9:37pm): A second vehicle that seemed to be involved in the incident is being loaded onto a flatbed, headed through the Holland Tunnel to New Jersey.